Preach My Gospel and the standard works are publications of The Church of Jesus Christ of Latter-day Saints, and are shown for reference purposes only. HolyTabbs is not a product of The Church of Jesus Christ of Latter-day Saints. ​"Best $15 bucks I will probably ever spend for my mission." Remove backing from the skin, line up the corners, and slowly lower the skin onto the inside cover of your scriptures. 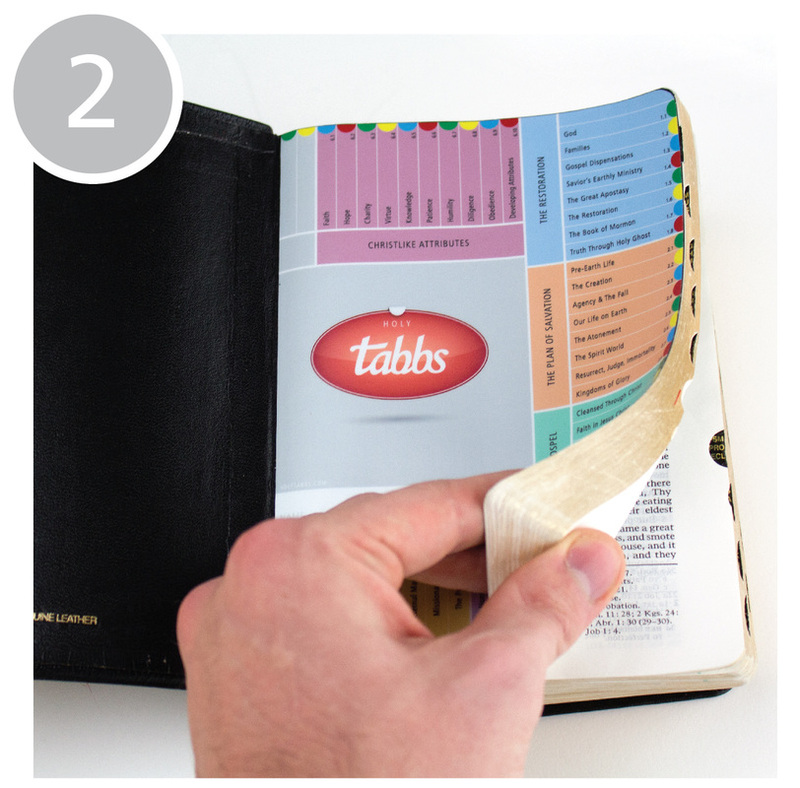 HolyTabbs comes in large, regular, and compact sizes to fit your scriptures perfectly. Apply pressure evenly across the surface, making sure to smooth out any air pockets. Use Preach My Gospel and our included scripture library to find your favorite scriptures. When you find a scripture, decide which lesson and topic it best describes. Each lesson is a different color. Lesson 1 is blue, Lesson 2 is orange, Lesson 3 is green, Lesson 4 is purple, and lesson 5 is yellow. Christlike attributes is maroon. Each lesson has multiple topics. 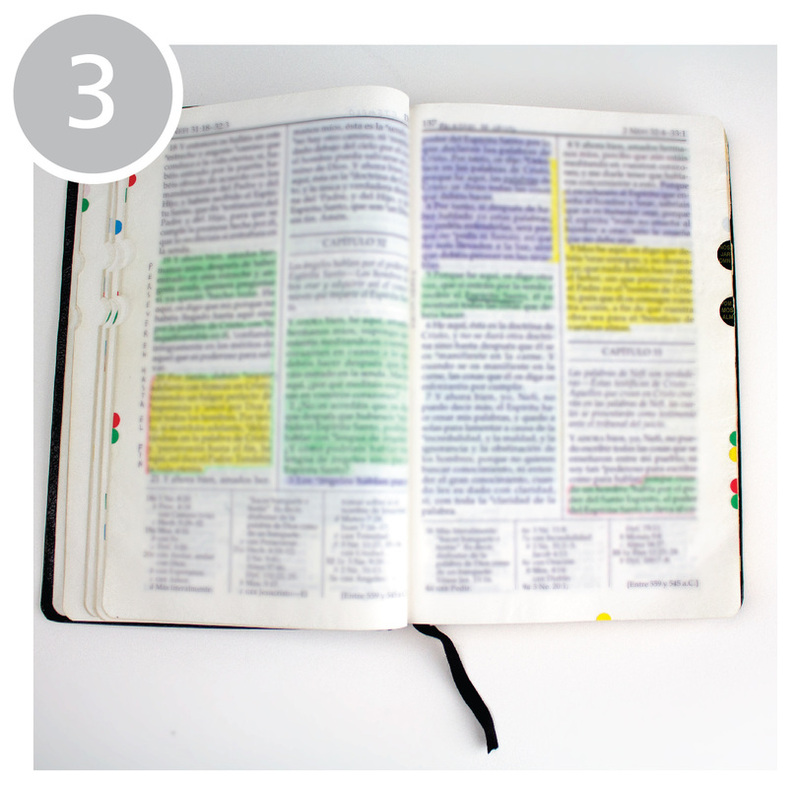 We recommend marking the scripture with the correlating Preach My Gospel lesson color, e. g . all the green scriptures in the picture are marked for Lesson 3 and all the purple scriptures are marked for Lesson 4. 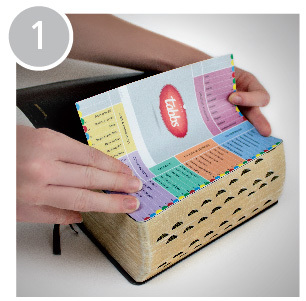 This way, when each page has multiple tabbs, you know which scripture goes with which lesson topic. Select the tabb color that matches the lesson topic tabb on your HolyTabbs skin. Bend it in half over the edge of the page with your scripture, being careful to line it up with the correlating topic. 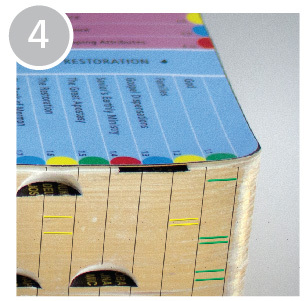 For example, the image shows the green tabbs lined up with the first topic of lesson one, which is "God," and the yellow tabbs are lined up with the second topic of lesson one, which is "Families." Use the included straight edge to give you a perfect tabb bend every time. That's it! You now have an incredible system marking each of your favorite scriptures! Notice how each lesson topic has a column of tabbs of the same color. The four tabb colors (green, yellow, blue, and red) alternate every four lesson topics to keep the columns divided visually. You can also draw columns with a pencil for even more tabb organization. 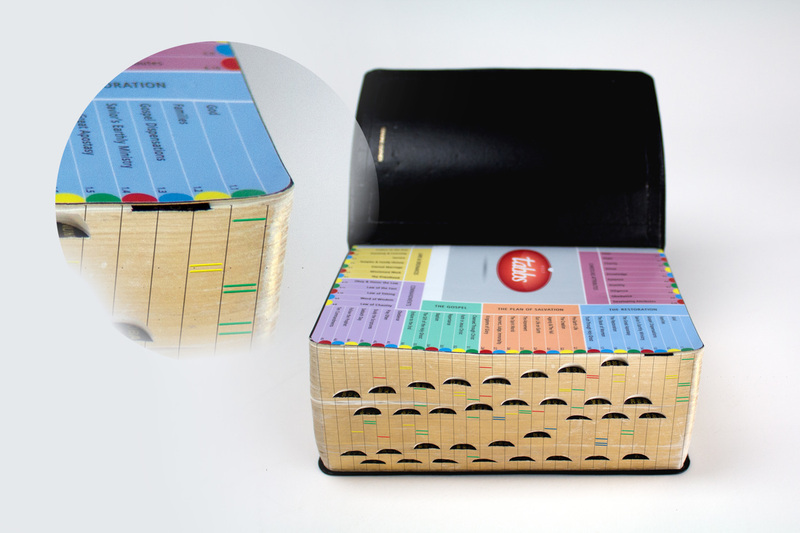 You can see how quickly you will be able to find a scripture about any gospel topic. With HolyTabbs, all your marked scriptures are literally 2 seconds away. 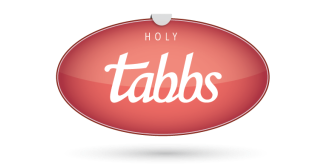 We really hope you enjoy using HolyTabbs!